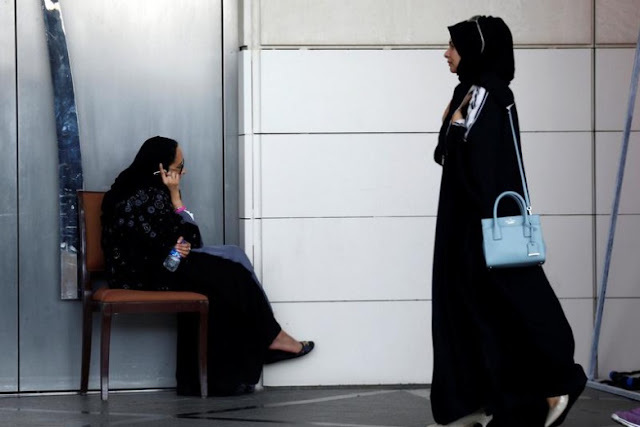 A Saudi woman speaks on the phone as another woman walks past her in Riyadh, Saudi Arabia September 28, 2017. RIYADH - Saudi Arabia’s lifting of a much criticized ban on women drivers will reduce the number of car crashes in a country with one of the world’s worst traffic-related death rates, its interior minister said on Thursday. King Salman announced the historic change on Tuesday, ending a conservative tradition which limited women’s mobility and was seen by rights activists as an emblem of their suppression in the kingdom where Islam originated. Saudi Arabia was the only remaining country in the world to bar women from driving, a policy that will officially end in June 2018 after a ministerial committee reports on measures needed for implementation. Prince Abdulaziz bin Saud bin Nayef, the interior minister who took over from his uncle in June, said security forces were ready to apply traffic laws to men and women, though he did not mention if women would be recruited as traffic police. “Women driving cars will transform traffic safety into a pedagogical practice which will reduce human and economic losses caused by accidents,” he was quoted as saying on the ministry’s official Twitter feed. He did not elaborate. Around 20 Saudis die each day in traffic accidents. Poor governance has contributed to Saudi Arabia’s woeful record in road safety, analysts say, and the government is aiming to reduce the number of deaths by a quarter as part of its ambitious Vision 2030 reform program. While Saudi women have generally praised the lifting of the driving ban, some men expressed concern it would dramatically increase the number of cars on already crowded Saudi roads. A middle- to upper-class Saudi family typically has two vehicles, one driven by the man of the house and a second car in which a full-time chauffeur transports his wife and children. The royal decree promises to change lifestyles for many of the 10 million women over the age of 20, including foreigners, who live in Saudi Arabia. It may also help restore auto sales growth in a market dented by the economic fallout from weak oil prices. But because of conservative traditions, it may actually take years rather than months for women to become a major presence on the roads in some areas. In a country where gender segregation has been enforced for decades, the decree means women will have regular contact with unrelated men, such as fellow drivers and traffic police. Saudi Arabia’s lifting of a much criticized ban on women drivers will reduce the number of car crashes in a country with one of the world’s worst traffic-related death rates, its interior minister said on Thursday.